The tomb of King Tut contained breathtaking treasures but it also contained some wonderful tomb paintings and scenes. Each wall of the tomb has a specific theme. The East Wall depicts the Funeral Procession, the West Wall contains text from the Amduat, the South Wall depicts his arrival in the Underworld and the North Wall of the tomb shows the arrival of Tutankhamun in the Afterlife. 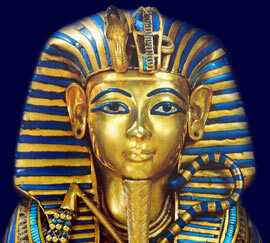 The tomb of Tutankhamun was discovered by the English Egyptologist Howard Carter in November 1922. There were so many artefacts in the tomb of King Tut that Howard Carter spent 10 years clearing and cataloguing the artefacts. These treasures tell of many secrets about the life of King Tut. But what did the Tutankhamun tomb paintings and scenes depict, what secrets do they hold? What clues do they contain about the life and, more importantly, the beliefs of King Tut? Due to the early and untimely death of the young King Tutankhamun only his burial chamber received decorations. The centre of the burial chamber contained the golden colored shrines which housed the large red quartzite sarcophagus, coffins and mummy of Tutankhamun. King Tut is associated with gold and all of the walls of the burial chamber have the same golden background making an ideal background to the tomb paintings. The Ancient Egyptians used art to idealise the person who was being depicted. Therefore the Tutankhamun tomb paintings conveyed a happy and orderly lifestyle. The Egyptian art style depicted all figures as young and healthy. The figures of people were drawn in profile, with one eye and both shoulders shown frontally and the legs where seen sidewise. The largest figure shown on tomb paintings was that of the occupant, in this case Tutankhamun, regardless of the actual height of the deceased (Tutankhamun was approximately 5ft 6ins). The colors traditionally used in tomb paintings showed that the body of a man painted as a dark reddish-brown color. The body of a woman was painted as lighter, yellowish-brown color. These differences in colors represented the mainly outdoor life of a man as opposed to the more secluded lifestyle of a woman. The colors used in paintings are highly symbolic and these symbolisms apply to the colors of the Tutankhamun tomb paintings. Six basic colors were used in Ancient Egyptian art and paintings - white, black, red, yellow, blue and green. A tiny pestle and mortar was used for grinding colors. The colors used were symbolic and all had different meanings. This symbolism of colors was used to great effect when depicting the images and characteristics of the various Ancient Egyptian pharaohs, gods and goddesses. The Amduat is the Book of the Secret Chamber and means "That Which Is in the Underworld"